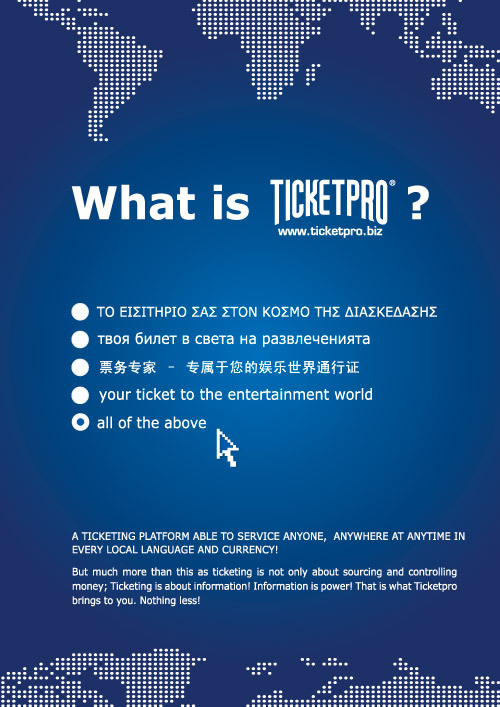 Ticketpro is a world leading provider of ticketing services for various events such as music concerts, sports games, theater performances, etc. The company has many offices in a number of countries around the world. This is our A4 size magazine ad design for Ticketpro, created for publishing in the famous IQ magazine. The main idea of the design is to represent the side of Ticketpro as an international company. This is achieved by designing a “multiple choice question” type of quiz with answers that appear to be different, but are actually the same – just written in different languages. The hint is in the arrow-shaped cursor which points towards the correct answer. The cursor also suggests that the quiz is done online and therefore speaks of the web nature of the services Ticketpro provides.